Nasser and Pouyanné at the signing ceremony held in Paris. Saudi Aramco said it has signed an agreement with French energy major Total to build a giant petrochemical complex at Jubail, Saudi Arabia, at a total investment of $9 billion. The complex will be integrated downstream of the Satorp refinery, a joint venture between Saudi Aramco (62.5 per cent) and Total (37.5 per cent) in Jubail, in a move designed to fully exploit operational synergies. This world-class refinery, whose capacity increased from 400,000-barrel-per-day at its start-up in 2014 to 440,000-barrel-per-day today, is recognised as being one of the most efficient in the world, said the Saudi oil giant Aramco in a statement. Located next to the Satorp refinery in the same industrial area, the complex will comprise a world-size mixed-feed steam cracker (50 per cent ethane and refinery off-gas) with a capacity of 1.5 million tons per year of ethylene and related high-added-value petrochemical units. Aramco said the duo is planning to start the front-end engineering and design (FEED) in the third quarter of 2018. The Saudi company said the project will represent an investment of around $5 billion. The cracker will feed other petrochemical and specialty chemical plants representing an overall amount of $4 billion investment by third-party investors. "The agreement deepens the exemplary relationship enjoyed by our two companies over many decades. It is one that has evolved from a standard buyer-seller arrangement to one imbued with common interests to further develop and diversify our businesses," remarked Aramco President and CEO Amin H Nasser at the signing ceremony held during the official visit of HRH Crown Prince Mohammed bin Salman of Saudi Arabia to Paris. "Our joint venture Satorp is a remarkably successful model of industry partnership and we are keen to build on this success to further underpin Saudi Aramco’s strategy to expand its capacity in the chemicals sector by 2030," stated Nasser. Total's Chairman and CEO Patrick Pouyanné said the project illustrates the group's strategy of maximizing the integration of its large refining and petrochemical platforms and of expanding its petrochemical operations from low-cost feedstock, to take advantage of the fast growing Asian polymer market. 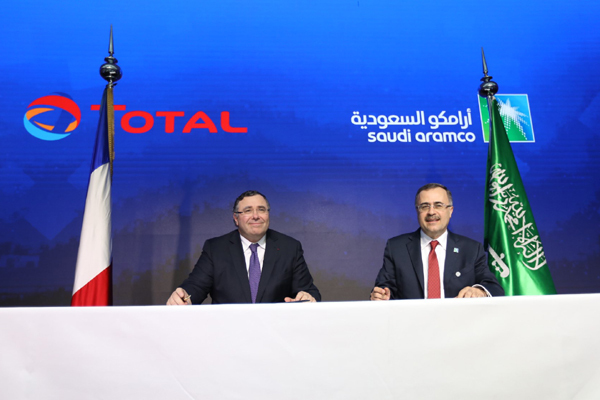 "Furthermore, this project will enable us to strengthen our ties with Saudi Aramco, with whom we successfully operate our biggest and most efficient refinery in the world," noted Pouyanné.